Norepinephrine or noradrenaline (BAN) is a catecholamine and a phenethylamine. The prefix nor-, is derived from the German abbreviation for "N ohne Radikal" (N, the symbol for nitrogen, without radical), referring to the absence of the methyl functional group at the nitrogen atom of epinephrine. Norepinephrine is synthesized from dopamine by dopamine Î²-hydroxylase. It is released from the adrenal medulla into the blood as a hormone, and is also a neurotransmitter in the central nervous system and sympathetic nervous system where it is released from noradrenergic neurons. 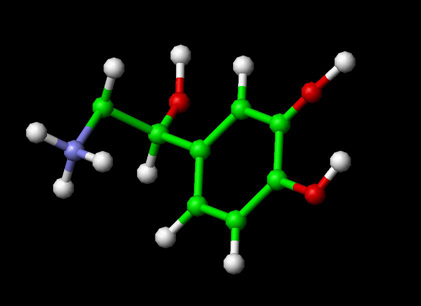 The actions of norepinephrine are carried out via the binding to adrenergic receptors. In the brain, this is caused in part by activation of an area of the brain stem called the locus ceruleus. This nucleus is the origin of most norepinephrine pathways in the brain. Neurons that are activated by norepinephrine project bilaterally (send signals to both sides of the brain) from the locus ceruleus along distinct pathways to many locations, including the cerebral cortex, limbic system, and the spinal cord, forming a neurotransmitter system. Norepinephrine is also released from postganglionic neurons of the sympathetic nervous system, to transmit the fight-or-flight response in each tissue respectively. The adrenal medulla can also be counted to such postganglionic nerve cells, although they release norepinephrine into the blood. Merck Index, 11th Edition, 6612. Introduction to Autonomic Pharmacology. Elsevier International.